The March 1933 federal election was the final democratic election before WWII - in which the the Nazi party recieved 43% of the vote. I'm curious how quickly the attitudes of ordinary German citizens shifted toward Hitler and the Nazis over time. For example - is there any data about what it was that German people liked about the Nazis that they voted for him? Did people who voted for the Nazis in 1933 later express regret about it? After the war, was there shaming from Germans who didn't vote the Nazis towards those who did? Do we have any data about this? I imagine opinion polling wasn't really a thing at the time. What about letters saying 'you know, I really regret voting for Hitler'. Or studies conducted after the war interviewing Germans about their feelings toward Hitler and their vote for him? From 1934–1943 we see all the hallmarks of charismatic leadership and a steady rise in popularity of the leader, the party and the regime. Quantitative data on this is fragmentary and not in the form of reliable opinion polls we expect from a modern newscast, but do not get their either. Qualitative data shows a seemingly consistent picture of support right to the end. After 1945 that changed considerably in disassociating Germany and the Germans – in the minds of Germans at least – from a lost war and the accompanying atrocities in crime and policy. While the majority kept most of the central themes internalised the larger part constructed a delusion: an image of demonic possession that was imparted by the 'evil aliens' of Nazis suddenly controlling the minds of the people who were then claiming to "have just followed orders". We have very few direct measures of public approval like it sometimes theorised to be expressed in voting behaviour. And that is despite some people working under Goebbels having studied with Gallup (and later founding the leading research center in Germany for demoscopy). Mainly in the beginning sheer terror was seen in the streets with SA-men patrolling with regular police and beating everyone they disliked, sending them to prison, torture or 'camps'. But that was toned down, the SA almost disenfranchised and much more subtle measures of oppression installed. And of course the propaganda ramped up together with the real perks offered to all those that were to be part of the Volksgemeinschaft. People really liked Germany 'getting Rhineland, Saarland, Austria, Sudetenland, CSR'. Theer was a short dip in popularity when the hot war started, but that faded with every victory in Poland. And especially when France fell Hitler could have declared himself God's newborn. The social benefits on the interior front were also of quite some standard – and continued to rise until things turned sour in Soviet Russia. Get a job, get a May-day celebration to honour your contribution as a worker, get food in times of at first poverty then continue to be fed when starting a war and rationing. Get free copy of Mein Kampf, get a piano cheap from previous Jewish owner, or a flat or house, go on paid vacation, enjoy the marches and speeches, Kraft durch Freude is there for you. Movies are at a height, providing joyous escapism, all media constantly tell you how great you are because of being a member of German society and the Aryan race. Who really cares that 'others' have trouble, including being killed for nor sensible reason? Who knew that the perks were on unsolid foundations, betrayal, money laundering, deceit and corruption. Who could really foresee that a war might not only be won, but also lost? By 1939 the motto "Germany is Hitler, Hitler is Germany" became reality. "The Führer has it easy, he has no family to take care of. If everything goes wrong with the war, he lets us sit in the dirt and shoots a bullet through his head." "If it had been known in 1933 that events would come to such a head, Hitler would never have been elected." Ian Kershaw: "The Hitler Myth. Image and Reality in the Third Reich", Oxford University Press, Oxford, 1987. German troops had occupied Prague on March 15 of that year. Hermann Voss, a professor of anatomy who was later the recipient of numerous honors in Communist East Germany, noted in his diary: “Charles University—the oldest German university and the mother of the one in Leipzig—once again in German hands! It’s hard to believe. What a blow for the Slavs and what a boon for us. We are living in a great age and should feel privileged to experience such things. What does it matter if butter is in short supply, coffee is sometimes unavailable, or you sometimes have to do one thing or another that you don’t completely approve of? Weighed against such progress, these problems are laughably trivial." The third fundamental pillar of Hitler’s popular support was his promise of equality for all members of the racially defined Volk. In the policies of wartime socialism that came into effect as of September 1, 1939, many Germans saw a credible vision of a more just social order. The war accelerated the obliteration of class barriers. The Nazi leadership was at pains to ensure that “in these times of shortages every individual Volk comrade will be provided for equally with the necessities of life, regardless of his social position and income.” The only privileges were for people who did particularly strenuous physical labor or had special needs. In early 1940, an observer from the Social Democratic Party reported from Berlin: “The working classes thoroughly welcome the fact that ‘the better off’ have, in practical terms, ceased to be that.” Egalitarian rationing policies increased the popularity of the regime. The inside of that book lists the rise and fall of public support. 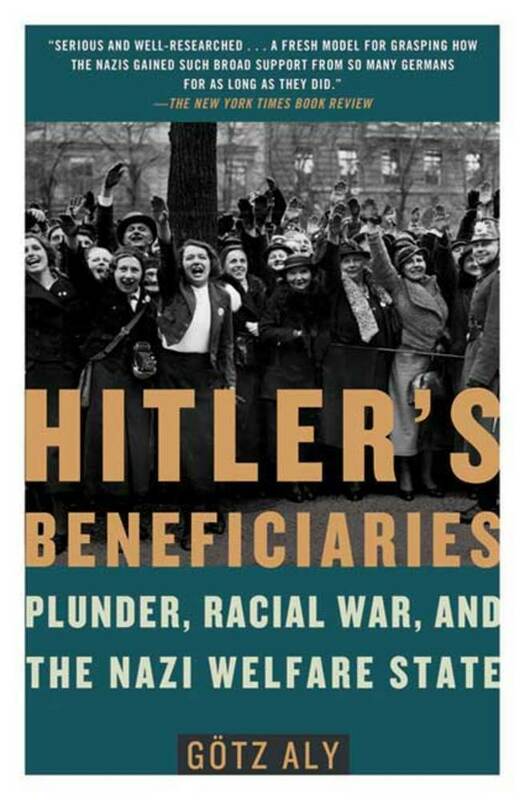 Götz Aly: "Hitler’s Beneficiaries, Plunder, Racial War, And The Nazi Welfare State", Metropolitan BooksNew York, 2007, (Review) Quotes here from that book. They cared quite much for public opinion and did try to find out. Aktion T4 was shut down because of public protest and the form the Endlösung took was heavily influenced by designing it outwardly so that plausible deniability of the act was an option (so they thought) for the population. They used mainly indirect means to measure the big support & approval that continually rose until 1942. It wasn't all stick, they also ate a lot of carrots. from 1935–1943, the "majority of the public was with them", that is a conservative timeframe. In a masterful work, Peter Fritzsche deciphers the puzzle of Nazism’s ideological grip. Its basic appeal lay in the Volksgemeinschaft—a “people’s community” that appealed to Germans to be part of a great project to redress the wrongs of the Versailles treaty, make the country strong and vital, and rid the body politic of unhealthy elements. The goal was to create a new national and racial self-consciousness among Germans. For Germany to live, others—especially Jews—had to die. Diaries and letters reveal Germans’ fears, desires, and reservations, while showing how Nazi concepts saturated everyday life. Fritzsche examines the efforts of Germans to adjust to new racial identities, to believe in the necessity of war, to accept the dynamic of unconditional destruction—in short, to become Nazis. Peter Fritzsche: "Life and Death in the Third Reich", Belknap Press, 2008. Frederic C. Tubach & Sally Patterson Tubach: "German Voices: Memories of Life during Hitler's Third Reich", University of California Press, 2011. The only remarkable thing about this would seem to be that the years between 1935 and 1942 appear as 'quiet' and 'normal' times—and this in the recollections of inhabitants of a working- class region where in the first years of dictatorship the labour movement suffered the fiercest persecution. Richard Bessel: "Life In The Third Reich", Oxford Univesity Press, 1987. That changed outwardly with start of 1945. When a British, American or Soviet soldier entered a village or city, a few people killed themselves, as life was now senseless without Nazi greatness, most were eager to express that they all were in the resistance and knew nothing of the brutality, war crimes, genocide –– even when questioned about that while living in a former Jewish home. "The population is an incredible mob, very many Jews and very many mixed people. A people, which only feels comfortable under the whip. The thousands of prisoners will do our agriculture quite good. In Germany they are certainly good to use, hard-working, willing and frugal." The Consensus Holds Social support for Hitler and for National Socialism steadily eroded as the war encroached more and more into Germany, and many people were certainly fed up. What is remarkable, however, was how resilient public opinion was, and, in spite of one defeat or major setback after the next, the surveyors of opinion found innumerable statements to indicate that morale held, in the sense that many people from all ranks of life were willing to continue the fight, even in the face of great hardship. Thus, after the Normandy invasion in June 1944, there were widespread signs of a positively exuberant optimism and some people yearned to get their hands on Allied troops. An even greater show of support for Hitler, virulent hatred of the conspirators, and expressed willingness to shoulder more burdens followed the attempt on his life on 20 July 1944. His explanation of the attempted coup, along with the use of the V-1 flying bombs and V-2 rockets—retaliatory ‘miracle weapons’—served only to renew the public’s faith in his ability to see them through. Opinion reports stated that ‘almost everywhere the bonding to the Führer is deepened and the trust in the leadership strengthened’. Historian Marlis Steinert, who notes these trends, adds that there was nothing less than ‘an astonishingly positive reception’ to Hitler’s New Year’s proclamation for 1945 and his confidence in victory. She and several others who have studied public opinion closely, have tended to magnify the ‘negatives’, like signs of dissolution, loss of faith, and the collapse of morale. However, while the mood and attitude of the people certainly shifted with the military or political situation, many people, and not just the died-in-the-wool Nazis, showed themselves anxious to interpret events in the most optimistic way possible. The last Nazi opinion reports from Berlin in March 1945 contain evidence that many citizens finally began to question propaganda stories and the more outlandish claims, but that many still showed ‘a good and confident attitude’. If the pessimists and defeatists were in the majority, the Nazi reporters were of the view that the balance would shift back if only the Wehrmacht could show an important victory. Certainly these last glimpses of popular opinion showed signs that people were losing faith, like three women who scoffed at a sign with the words of inspiration that Berlin ‘works, fights, and stands’, placed in the windows of Berlin’s famous department store, the Kaufhaus des Westens. We also find remarks scattered in these last reports that suggest what Germans were saying among themselves. Two workers in Spandau-West were overheard by the opinion surveyors as saying ‘that we have only ourselves to blame for this war because we treated the Jews so badly. We shouldn’t be too surprised, if they now do the same thing to us.’ These workers acknowledged Germany’s persecution of the Jews, but there are no indications they felt any remorse. They were prepared for the inevitable outcome and believed, as Hitler had prophesied, that they were experiencing the retaliation of the Jews and their influential friends around the world. The Nazi reporter who overheard this exchange noted that ‘similar observations now are often heard’. Such fragmentary evidence suggests that Nazi allegations over the years that the Jews and some sort of conspiracy caused the war had taken root. In fact during the last two years of the war, letters (including some from academics) were sent to the Ministry of Propaganda suggesting that the Jews remaining in Germany be collected at likely bombing targets. The number killed would be publicized after each raid. One letter said that even if this did not work to stop the Allied flyers, at least many Jews would be exterminated. Another suggestion was to threaten the Americans and British that tenfold the number of Jews would be shot for civilians killed in a given bombing raid. Robert Gellately: "Backing Hitler. Consent and Coercion in Nazi Germany. ", Oxford University Press, 2001, p253. That outward expression of disgust after the war towards Nazis, their party, politics and principles after the war was of course just lying. Inwardly a quite big proportion of people continued to approve of most actions, citing a few mistakes, and even "if only Hitler knew that", or "he built the Autobahn". The only real downside for all of those is still just that a war was lost. That is of course never really popular. Today a party full of genuine Nazis and an official policy to disregard 12 years of Nazi-regime as a fly's dropping compared to 1000 years of history, the voting approval rating of undisguised Nazi positions reaches 80 seats in parliament again. That is just in accordance with what happened directly after the war. Q Did people who voted for the Nazis in 1933 later express regret about it? After the war, was there shaming from Germans who didn't vote the Nazis towards those who did? Some did so. But for the most part and in both Germanies the former Nazis just became jurists, doctors, civil servants, politicians or private sector industrialists. In short they mainly just continued to be the ones in power, being largley sacrosanct from attacks about their political past and current succcesses. During the 1960s the first voices of dissent came from students, garnered public support from the repercussions of the Auschwitz trials and throughout the time of her existence the GDR tried to inform the world about this often unbroken continuity in personal, politics and attitudes. By far not all of that was mere socialist propaganda. The elites kept largely their places, influence and attitudes. A really tiny minority was prosecuted, even shamed publicly. But the vast majority of die-hard nazis just kept on naziing, now under 'democracy': Globke, Kiesinger, Schleyer, Filbinger, Beisheim are just some of the world-known examples. When in 1994, after decades of negotiations, the USA returned documents from the Berlin Documentation Center (BCD) to the Federal Republic of Germany, the public gained the impression that the Federal Republic had been governed in its early years by former NSDAP members. The NSDAP membership card index kept in the BCD revealed familiar names: three Federal Presidents - Karl Carstens (CDU), Heinrich Lübke (CDU) and Walter Scheel (FDP), who was previously Foreign Minister -, the former President of the German Bundestag, Richard Stücklen (CSU), the Foreign Minister Hans-Dietrich Genscher (FDP), the Economics and Finance Ministers Karl Schiller (SPD) and Liselotte Funcke (SPD), the head of the Chancellery Horst Ehmke (SPD), the former leader of the CDU/CSU parliamentary group, Alfred Dregger, and many others. The impression was not misleading. In Willy Brandt's government alone, twelve former National Socialists sat at the cabinet table. Katja Tichomirowa: "Nazi-Vergangenheit von Politikern Ein doppeltes Spiel", Berliner Zeitung, 21.06.2013. This Liste ehemaliger NSDAP-Mitglieder, die nach Mai 1945 politisch tätig waren is horrible – mainly in incompletenes. Support for wars, nationalism, antisemitism, political hatred directed at groups like xenophobia, homophobia, plain racism etc are quite stable over the course of the years since 1945 at 10% of the population for the openly extreme forms and 50–60% for the more disguised forms like secondary antisemitism. The support for most actual political content of nazi policies is still at the same level as of 2018. It might be misleading to focus just on 'voters', after the war. After all the NSDAP never had a majority vote to begin with when the conservative elites instructed them to take power. The more interesting angle are indeed the coping strategies of the 'ordinary' executioners of Hitlers will. Apart from the sources already mentioned, which do include some doubts, regret and misgivings over the (time) course of the war, the focus of most material is on the own hardships, stupid military leaders, which curiously often make Hitler ou as not being part of that. And in parallel to "who'd have known in 33 what came to pass" there was "if only the Führer knew!" (he'd rectify the situation). REITER: He was a historical figure; only history will be able to give him his proper due; one must first hear all that happened; we have heard nothing. Those incompetent fools who never told the FÜHRER that he was being lied to in reports etc! We, too, shall be blamed for that, you can be sure of that. In return, the German population frowned and said: you spoke throughout this war of freedom, but now you impose on us only restriction and deliberate suffering. What do you want with us seventy million? Only to make us suffer more than we already do? Yes, the war was bad. However, we are not just the people of Hitler and Himmler, but also of Beethoven and Goethe. We have lived here in the heart of Europe for hundreds of years, mostly no less peaceably than our neighbours. We shall carry on living – unless you want to kill us all. So, again, what do you want with us? Frederick Taylor: "Exorcising Hitler. The Occupation and Denazification of Germany", Bloomsbury: London, 2011. For example the works of Harald Welzer like "Opa war kein Nazi" ("Grampa was no Nazi" 2002) show that this is still by far not the majority position in private family memories. For quite an intimate account, albeit very much on the side of unreliability for most of its content pertaining to the subject matter, Hitler's secretary allows quite the insight into the psychology of a very ordinary German. According to Traudl Junge, she never felt sorry for herself, even in the chaotic hours and days of the collapse of the Third Reich. "That would be even better," the reader may think. However, it does not only distinguish them from many of their closest colleagues at that time, but from the broad mass of contemporaries who subsequently stylized themselves into "victims". "These were difficult times…" - "It was just war…" - These were phrases that made it easier for many after 1945 to suppress or at least trivialize the facts of the persecution of the Jews, the extermination camps and other National Socialist atrocities. They had experienced the "total war" and its material and ideational destruction as a "total collapse" and had set themselves up against the fiction of a "zero hour". They spoke of the "eliminated spook" and the "broken spell". They tied their hopes to the new epoch "after the war", perpetrators as well as persecuted, passive followers or vicarious agents, as Traudl Junge was one. She never felt innocent after the war. As torturously present as her shame and grief over the Nazi disgraceful deeds are, it has been difficult for her to locate her co-responsibility beyond a diffuse, abstract self-accusation. Her personal failure, if she finally finds out, lies in having called on Albert Bormann's help. She wanted to go to Berlin in 1941 and was furious and stubborn about the difficulties her Munich employer had put in her way. In order to achieve her goal - Berlin, not the Reich Chancellery or even Adolf Hitler - she silenced the warning voice that had spoken to her: "Don't get involved with the party - that can't go well. When she finally stood before Hitler after a series of coincidences, it was too late to resist, she says. Today she knows that she was blinded by him - not by his ideological and political intentions, which never interested her much, but by Hitler as a human being. She does not belittle the fact that she served him as a lady of society, while he and his helpers pursued the "final solution". She admits that she probably only knew half nothing about the extent of the persecution of the Jews because she did not want to know. Traudl Junge: "Bis zur letzten Stunde. Hitlers Sekretärin erzählt ihr Leben. Unter Mitarbeit von Melissa Müller", RM Buch und Medien: München, 2002. It's hard to say what the numbers really were, because the data are "dirty," as discussed below. The only thing that is reasonably inferrable is that Nazi approval ratings rose and fell with the party's fortunes. As you said, in the March 1933 federal elections, the Nazis received a plurality of 43% of the vote, and a bare majority of 51% counting the votes of their allies, the Nationalists, in what William L. Shirer in "the Rise and Fall of the Third Reich" characterized as "the last relatively free, democratic elections in Germany until 1945." At that time, Germany really was "split down the middle," about 50-50 on each side. Later that month, the Enabling Act was passed in the Reichstag, 441 to 94. This 83% percentage overstates the approval of the Nazis at this point, because a large number of dissidents (particularly Communist deputies) were in jail. But thereafter, "100%" of eligible voters approved of them for most of the war. That wasn't 100% of all voters, but people who dissented were quickly arrested and deprived of their voting, and civil rights, meaning that the Nazi approval rate was 100% of the (reduced) denominator. After the war, "100%" of Germans were against the Nazis. That's not literally true of course, but the ones that were pro Nazi hid their feelings and did not express their views in public (except for a radical fringe). The difficulty with a question like this in a totalitarian state is that no-one in government cared what the people thought; and anyone else who attempted to find out was promptly shut down. Certainly the various police forces, particularly the Gestapo, cared about the actions, words, and even potential thoughts of individual persons; but solutions were always individual. Through arrest, harassment, murder, execution and coerced suicide, depending on the political advantage thought too be obtained, individual persons opposed to the Nazi regime were steadily eliminated or removed from public life. Further the range of political crimes with which one might be charged ranged so widely - from being a Freemason, Jew, or homosexual to not enrolling your children in Hitler Youth - that even statistics on arrests are not likely to provide meaningful data in the sense that you describe. Further, many of those arrested might even be Nazi supporters at some point in time or degree of scale - that no longer mattered once was identified as an enemy of the Reich. As for taking an opinion poll - that would have been shut down at the first public whiff, with the instigators clearly guilty as enemies of the Reich. The presumption of totalitarian governments is always that an overwhelming percentage of the population is with them - and thus justifies nay and all means of crushing dissent. Not the answer you're looking for? Browse other questions tagged nazi-germany nazism or ask your own question.